Brinkmann 821-7000-0 Solar Home Security SL-7 Motion Detector - Used. Home > Home Improvement > Brinkmann 821-7000-0 Solar Home Security SL-7 Motion Detector - Used. Solar rechargeable motion sensitive security light. 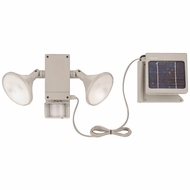 Two 3-watt spot to flood adjustable bulbs and adjustable remote solar panel with 15 ft. cord. Motion sensor is shielded and contains an automatic temperature control adjustable from 3 to 75 ft. range.